You’ve saved up your nickels to buy the car you’ve been lusting after - a shiny, unmolested, perfect low-mileage example of your dream ride. Not so fast - here’s why buying a museum-grade car can be a colossal mistake if you enjoy driving. Look, I get it - humans are genetically pre-programmed to enjoy things that are new and immaculate because it’s the easiest way of determining value at a glance. It’s also what separates us from the thumbless animals and their used, rusty appliances. But when this quirky trait is carried over into the realm of automobiles, it can get quite strange indeed. As I’m told humans are also visual animals, I’ve included a listing for an extremely low-mileage example of a 1998 Toyota Supra at a price that approaches monocle-droppingly offensive. 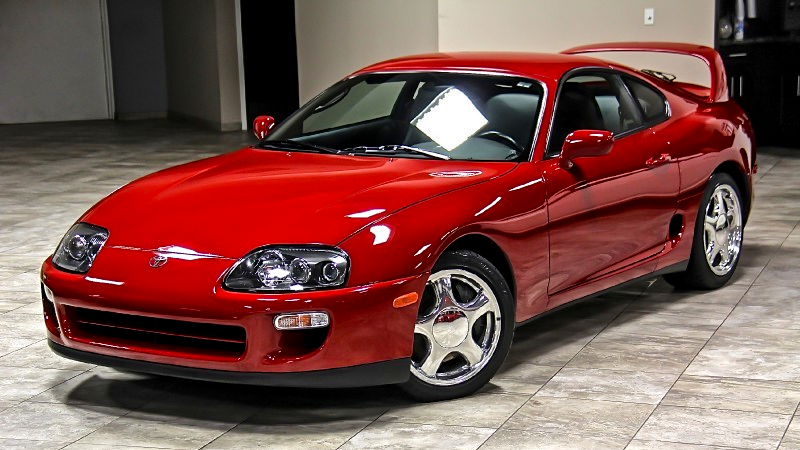 This 1998 Toyota Supra Turbo is the last of its kind, meaning it’s the final production year of the model that helped catapult the Fast And Furious franchise to new heights with car bros the world over. Its twin turbocharged 2JZ-GTE engine had the power potential to put a Mclaren 650S to shame in a straight line with a few off-the-shelf modifications and its six-speed transmission was borderline un-freaking-breakable. You’d think that with all this overengineered heft in its powertrain, it would make sense as the perfect daily driver or road trip machine, but this car, almost literally left by the wayside, has less miles on its odometer than most early Chevy Cruze lease returns. The 15,000 mile figure is an interesting one, if only for the fact that when looking at the car’s vehicle history report, you see that from its birth in 1998 to 2002, it was driven 12,000 miles - pretty typical for a car that’s taken out to humblebrag in the church parking lot, but between 2002 and 2015, only 3,000 miles were clocked. This means that it was essentially driven nonce for more than three quarters of its 17-year span, and a car that sits for extended periods of time is never a good thing, no matter what your dad’s insurance agent tells you. A few key things can happen when a car is left idle - none of which are good for you, the owner. Glycol-based coolant degrades over time and can damage water pump seals, not to mention corrode the engine’s passages - a big deal considering the 2JZ-GTE has a cast iron block that’s particularly susceptible to rusting from the inside if that isn’t managed properly. Conventional motor oil, which is most likely what was used on this car, can degrade via its additives separating with fluctuations in weather. The engine also becomes susceptible to water condensation buildup, where the moisture in the air sticks to the cylinder wall liners and all metal parts that aren’t coated in oil. This is a real issue with cars that aren’t driven up to operating temperature - and it’s the same reason that a car that hasn’t been started in a while can exhibit some white fog-like smoke from the tailpipe on startup. It’s condensation being evacuated from the combustion chamber and exhaust, and can only be remedied by running the car up to operating temperature and pressure for both oil and coolant - a process which can take up to 20 minutes, depending on climate. Operating temperature is also integral to the gear oil in the differential and manual transmission, it must be brought up to temperature so it can adequately lubricate all relevant components. Otherwise, you’re just mashing gears together. Oil also tends to fall into the pan, making startup after an extended period of sitting especially hazardous because you’d be starting the engine with its upper components like cams essentially dry. Cars that are constantly used don’t have this issue because there’s not enough time between starts of the engine to have all the oil make its way down to the pan. Rubber suspension components absolutely go bad if left idle, and even if the car was driven sparingly, it’s likely that over time and short heat cycles, they’d perish and crack. The ball joints on the Toyota Supra aren’t serviceable, meaning that they don’t have grease fittings to lubricate the various ball joints, so the grease within ball joints and axles can harden and if you combine that with the very real likelihood of a cracked rubber boot, it introduces extra heat into a system, reducing the life of that part drastically, and that’s not even considering the most important rubber component of all - the tires. Most people aren’t aware of this, but all tires have a use-by expiration date stamped on its side. This is because the compounds within the tire can dry out with exposure to sunlight and the heat cycles associated with use, no matter how long you drive. It’s called dry rot, and If you ever get the chance to compare the feel of an old tire versus a new one, it’s noticeably harder and more brittle, leading to handling that is not only unpredictable, but in the case of Paul Walker and Roger Rodas, actually tragic. This means that just like milk, when you buy a tire, you better use that sucker before it goes bad, otherwise you’ll probably ruin a perfectly good pair of pants. In-tank fuel components, if made with metal, can also rust from the inside out since unused gas can varnish quite quickly, especially with the added ethanol content that modern pump gas requires. For reference, here’s a picture from my Mazda RX-7’s fuel pump - it had been sitting for a few years with no other contamination of the fuel tank. The tank was drained and cleaned and fuel pump was replaced in order for the system to work properly. With such a long list of things to look for, it makes virtually no sense to buy a decades old car with extremely low mileage if you’re looking for a good driving example of the model. Sure, the paint and interior could be in great shape, but the engine may be one lucky start away from a spun bearing because entropy is one hell of a thing. In my opinion, I’d much rather have a car that was driven every day, with maintenance and repairs accounted for - even if it had higher than average mileage. After all, especially in the case of this Toyota Supra, the drivetrain can handle six figure mileages with ease with low-to-no maintenance operation over years of ownership, so why keep the car as a garage ornament? There’s no downside to driving it, with an enormous upside. Find an older one with 120,000 miles on it, pay 20 percent of the asking price of this museum-quality example and never look back. I did exactly this, and it’s been one of the most rewarding automotive experiences I’ve ever had. Remember - resale value only hurts if you’re not keeping it, and I ain’t skeered. Tavarish is the founder of APiDA Online and writes and makes videos about buying and selling cool cars on the internet. He owns the world’s cheapestMercedes S-Class, a graffiti-bombed Lexus, and he’s the only Jalopnik author that has never driven a Miata. He also has a real name that he didn’t feel was journalist-y enough so he used a pen name and this was the best he could do.